These picture were taken during one of those random bits of full on sunshine that we have been getting here in the UK, otherwise it's pretty damn cold right now. I do like a bit of sunshine when its a bit more crisp outside. I like the feeling of the sun shining on your face when you're all layered up. I do know that these moments are going to be far and few between, especially for those of us with standard working shifts. We will soon be arriving and leaving for work when it's dark. I dread these months because I suffer with Seasonal Affective Disorder. I have depression and the lack of sunshine has a really big impact on my mood and level of depression. Before I go off on a tangent, my point is that I start to worry about when my SAD is going to really kick in properly, when is it going to get really bad again? I try and deal with it in different ways, one thing I often do is pick up some sort of crafting hobby. Which can help some times. One other thing that I try to do, is to continue dressing as I usually would, with bright colours or a print. Of course, like lots of other people during the winter is when a bit more of the darker colours come in to play. I do like to keep this mixed up with some of my favourite patterns or colours. It's something small like this that can help put a smile on my face at some point through out the day. It could be when I'm sat on a bus of muted colours and see that I'm wearing some in your face jumper. It might be spotting my outfit in the mirror of the bathroom at work and liking what I see. It would be easier to wear comfy trousers and basic knits throughout my difficult winter months. But I try not to. This jumper was purchased with one of these days in mind. 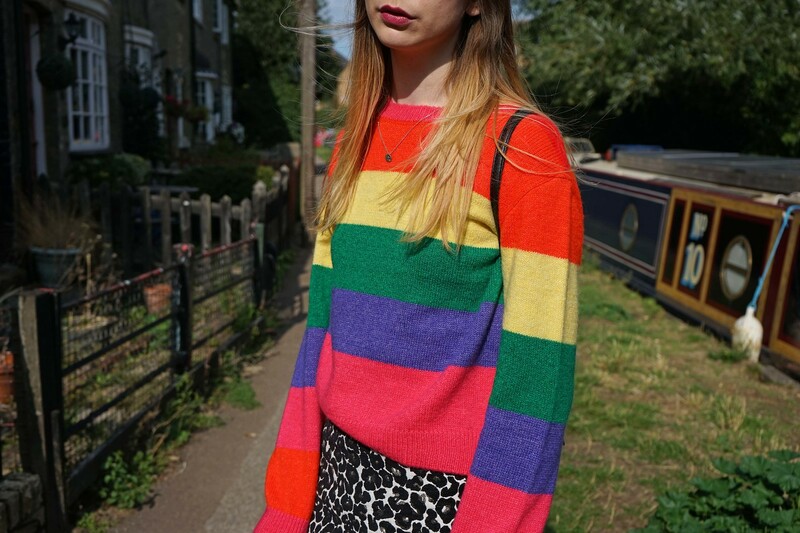 It felt soft, I wanted to treat myself to a new knit and I thought that this rainbow delight might brighten me up for a moment on a particularly SAD day. 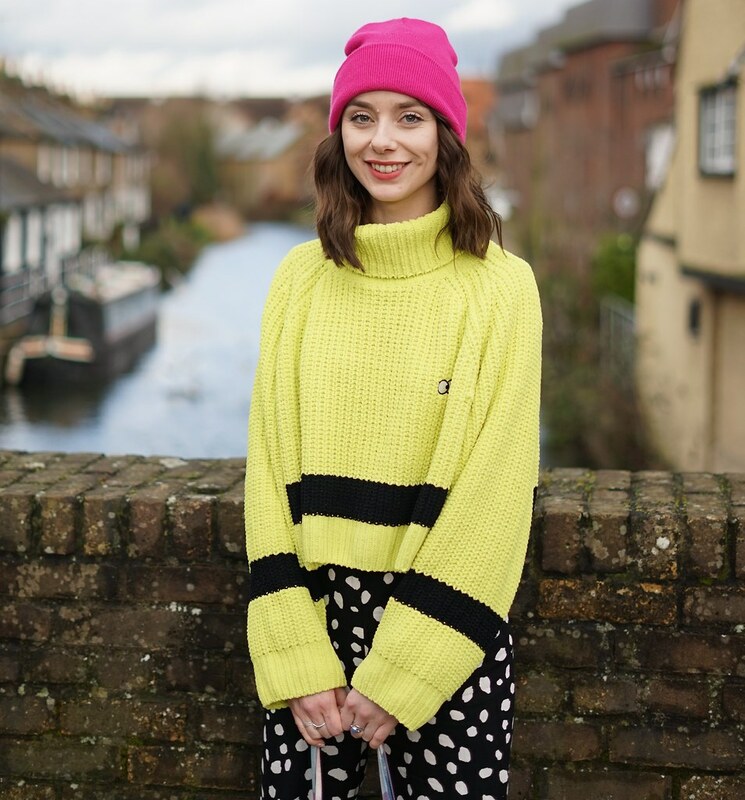 I got this jumper from Primark a few months ago, they have lots of lovely colourful autumnal pieces in stock at the moment. If you've not shopped Primark for a little while you might want a wee wander in, you may be in for a little treat. Even though you may not have seasonal affective disorder, it is common to feel a little down in the winter months. Are there any tips you have to lift your mood in winter?